It’s also helpful to play a lot with letters: I like magnetic letters for the refrigerator (which you can use all over the house) and duplo letters. Everything you have more than one of is a math toy! You can count how many blocks you have, figure out whether you have more trains than balls, and so on. A few helpful specialty math tools are: a set of Duplo numbers, which you can use for counting, number recognition, while mixing them into your building tools, Unifix Cubes, and a great app called Bedtime Math. Every night at bedtime, we read a story problem and solve some math puzzles related to that story. I like wooden puzzles for younger children and jigsaw puzzles for older kids. Melissa and Doug is generally a reliable brand. Babies 6 – 18 months like stacking toys and shape sorters. Toddlers love wooden train tracks to assemble and a big collection of wooden trains . There’s tons of great building toys for older kids (I list many here in my STEM Gift Guide) but my all-time favorite is building toy to give is a basic Duplo set. For a 5 – 6 year old, choose basic Legos. I would recommend several balls of varying sizes and textures, a Nerf style baseball bat , a Strider bike , and plenty of time to run and play indoors and out. Imaginary play and telling stories with characters is one way to build interpersonal intelligence. Choose a few stuffed animals or puppets, a collection of finger puppets to tell stories with, a toy picnic basket with fake food. This category of intelligence isn’t about tangible stuff. It’s more about interaction and emotion coaching, and also making sure your child has time for quiet contemplation and down time. 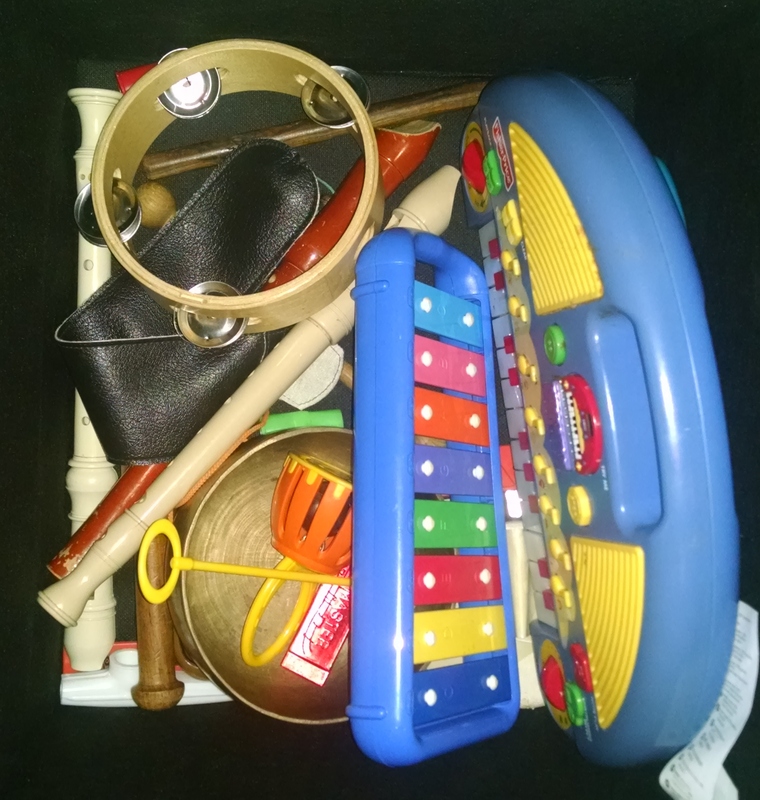 We have a box of miscellaneous musical instruments he can pull out anytime he wants. A few were purchased for him, but most are just items that have entered our lives over the years, like the plastic Yamaha recorder I had as a child, and the plastic Yamaha recorder I had to buy for my daughter’s class when I couldn’t find my old one… We also have a very old electric piano that’s in his room and he spends part of many “nap times” exploring the piano. We listen to a lot of music together (one older sibling loves Broadway show tunes, one loves vintage jazz, Abuela loves classical and Spanish music) and sing songs A LOT, and enjoy circle-time songs at BC classes and library story times and hymns at church. As you can guess if you’ve read other posts on my blog, we spend a lot of time outdoors. Camping, hikes, zoo trips, farmer’s markets, walks to the library and the pool. The only “tools” we use outdoors are a bucket and a shovel. (But, when we forget them, a stick and a rock can fill in as digging tools, and an empty Starbucks cup from the car makes a fine bucket.) Some day we’ll find our binoculars again, and pick up a new magnifying glass. We have a big box of miscellaneous dress up – old Halloween costumes from his siblings, sunglasses, silly hats, etc. In all of our books and the videos we watch together, we aim for showing lots of diverse cultures and experiences, and we go to a church that talks a lot about diverse beliefs and appreciation of the sacred in all forms. This is the one area we have an abundance of STUFF. One cabinet in the kitchen is over-flowing with art supplies: Model Magic clay , no-spill watercolors , pom poms, pipe cleaners, paint , paper, glitter glue, stickers, markers, crayons, beads, scissors, and so on. When he and I are in a relaxed, mellow mood, we pull these out and get to work. I try not to do much art when I’m in a cranky mood, or when I won’t have time to deal with any mess that arises. I have to confess that I can have a hard time when he’s being really messy or “wasting” art supplies, or “messing up” art supplies – like when he dips the red-paint-covered paintbrush into the yellow paint. Because I know that about myself, I make sure that he has plenty of opportunity to do art in spaces that are designed for kids’ art and where it’s OK to make a mess. So, this year, he’s enrolled in Creative Development Lab, which is all about exploring and experimenting with art. In addition to buying stuff for your kid to play with, also make sure they have some time to play with you that is child-directed – where they get to decide what they want to play. Learn more about child-directed play. If you have an older child, check out my Gift Guide to STEM Toys for Ages 3 – 6. 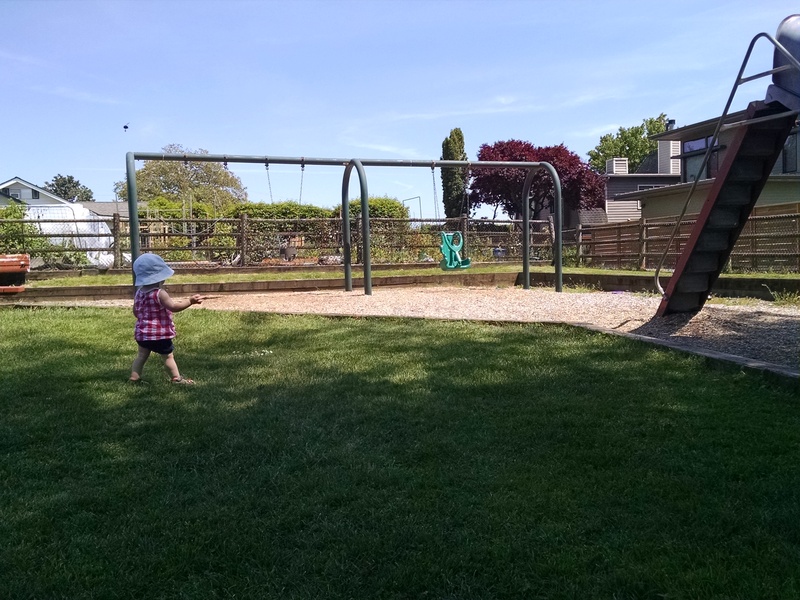 This entry was posted in Child Development, Play and Fun Activities and tagged Books and Resources, minimalism, nature, play, preschool, simplicity, toddler, toys on April 23, 2019 by Janelle Durham. A fun activity to do with your child where s/he learns new skills and you get new ideas? Opportunities to meet other families and build community? Expert advice and research-based information about parenting and child development? Support from professionals and other parents for the challenges of life with a little one? You can find all these great opportunities in one place! In the Seattle area, our community colleges sponsor parent education programs, including parent-child programs and cooperative preschools, which are a fabulous resource for families. For children, classes offer hands-on learning, discovery and play. For adults, they offer on-going education on all topics related to parenting, plus connections to other parents. What is the children’s experience like? Classes also include “circle time” or “music class” where the teacher leads the class in singing songs, dancing, playing musical instruments, and reading stories. This is a chance for children to practice sitting still, listening to a teacher, and participating in a group activity, all essential skills for kindergarten readiness. Academic skill-building (reading, writing, pre-math skills) is integrated into all types of activities. What makes these children’s programs different from other programs? Diverse Experiences in One Familiar Setting: Most children’s programs focus on one domain of learning: dance class, art class, story time, music class, or tumbling. These programs do it all. And they do it in a known space where the child feels safe and comfortable. Some of the same toys activities reappear from week to week to provide reassurance and routine, and some new toys and activities rotate in to encourage children to explore and try new things. Long-Term Relationships: Lots of programs run in short sessions of 4 – 6 classes. Parent ed programs run for the full school year. Seeing the same children week after week allows kids to build friendships. Close parental involvement: Parents are always welcome in the classroom. What are they like from the parent perspective: how do they work? Parent-infant Classes and Parent-Toddler Classes: Meet weekly for two hours. Every other week, the parents attend a one hour parent education session. In infant classes (for babies birth to one year old), the baby remains with the parent for parent ed. In toddler classes (for one-year-old and two-year-old toddlers), children are encouraged to play in one room with the children’s teachers and other parents while their parent attends parent ed. Staffing and Parents’ Role: Each class is staffed by a parent educator and one or two children’s teachers. Parents provide snacks for the class on a rotating basis. Each family may bring snacks 1 – 3 times a year. Parents may also be asked to help tidy up the toys at the end of the class. Cooperative Preschools:Three-year-olds may attend 2 or 3 days a week, four-year-olds attend 3 or 4 days a week. Typically, the parent stays with the child and works in the classroom one day per week, and the other days are “drop-off” preschool for that family. Classes may be 2 – 3 hours long. Staffing: There is a preschool teacher, trained in early childhood education, who is responsible for planning and coordinating the children’s activities, and leading group times. A parent educator observes / consults during some class sessions, and offers a monthly parent education session plus one-on-one expert parenting advice. Parents contribute by working in the classroom once a week. They also help with the running of the school by: providing snacks, fundraising support, helping with end-of-year cleanings, serving on the board (chair, treasurer, secretary, etc. ), or as class photographer, play-dough maker, etc. Length of program: Most classes (parent-child and coops) meet for the full school year – September through May. [Note: you may be able to enroll mid-year, if there are spaces available. Check with the programs to find out.] Some have summer programs. Parent education and support: Mommy Matters $22 plus child care costs. Baby Peppers $10. Art programs: Kidsquest $17 per hour. Kirkland Parks $13. Kirkland Arts Center $10. Music programs: Kindermusik $22, Kirkland Parks $11. Bellevue Parks $21. Bellevue public schools, $10 per hour. Bellevue Boys & Girls Club $10. Bellevue Christian School $11. Bellevue Montessori $18. Jewish Day School $19. Villa Academy $18. Seattle Waldorf $22. Cedar Crest $24. Note: most preschools have an adult/child ratio ranging from 1:6 – 1:9. At a coop, the ratio may be 1:3 or 1:4. All the parent education programs and cooperative preschools offer scholarships to lower income families which can further reduce the cost. What makes these programs different from other programs? College credit and student privileges: Parent education programs are college classes, and parents receive college credit for attending. They can also receive student ID cards, which depending on the school may give access to services such as fitness center or gym access. They may also allow you to get student discounts at a wide variety of local and online businesses. Parent Education: Experienced professional educators offer information that is current and research-based but also relevant to the day-to-day reality of parenting little ones. Topics are tailored to the age and needs of the families, but may include: daily routines, discipline, child development, early learning, nutrition, potty training, emotional intelligence, kindergarten readiness, and self-care for parents. Individualized Advice: Parent educators and children’s teachers have the opportunity to get to know each child as an individual, and also get to know parents well. This allows them to answer questions in a highly personalized way. They can also refer on for additional services when needed. Parent Involvement: Participating in your child’s classroom from day one encourages you to think of yourself as an active participant in your child’s learning and an advocate for them in future classrooms. You’ll know the other children and can help your child learn about them. You’ll know what happened in class, so you can later reinforce the learning. Seeing classroom activities may give you new ideas for what you can do at home to enhance your child’s development. Having the opportunity to observe other children each week helps give you a deeper understanding of child development, and seeing parents respond to their children shows you options for parenting style. Peer Support and Long-Term Relationships: Parents meet with other parents over the course of many months, which allows for long-term connections. Working together on projects strengthens those bonds, as does the peer support gained when parents discuss and share the joys and challenges of caring for kids. Programs offer classes for families with children from birth through age 5, so instead of having to search for new classes every month or every year, you always know where you can find a fun and educational class for you and your child. Learn More about Programs Near You and Register Now! Note: Classes for each school year start in September but it is best to register in spring or summer, because they do fill up! Green River CC. Limited info available on their website: www.greenriver.edu/academics/areas-of-study/details/parent-child-education.htm. Auburn area, birth to age 6. Learn more by searching for: Benson Hill Coop in Kent, Tahoma Coop in Maple Valley, Covington Coop, and Darcy Read in Des Moines. *Not all ages served at all sites. For example, most programs only have infant classes at one site. Would you like to print this information for your reference or to share with a friend? Get the PDF here. 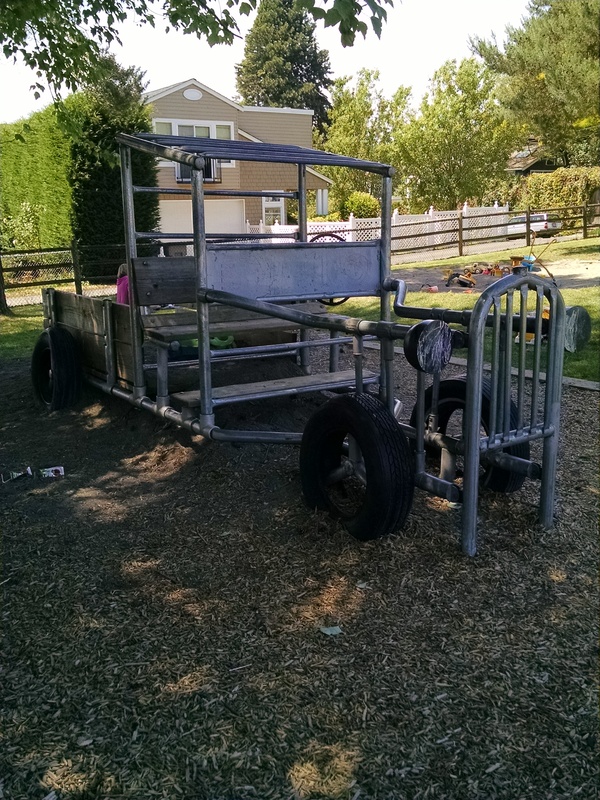 This entry was posted in Early Learning / Preschool, Parenting Skills, Play and Fun Activities, Seattle area and tagged baby, bellevue, class, coop, Edmonds, Kirkland, Parent, preschool, Seattle, toddler on August 2, 2016 by Janelle Durham. I’ve heard about Tot Lot for years and finally made it there… its claim to fame is that it’s a fully fenced park, so it’s easy to sit and relax while your tots have fairly free run of the space. 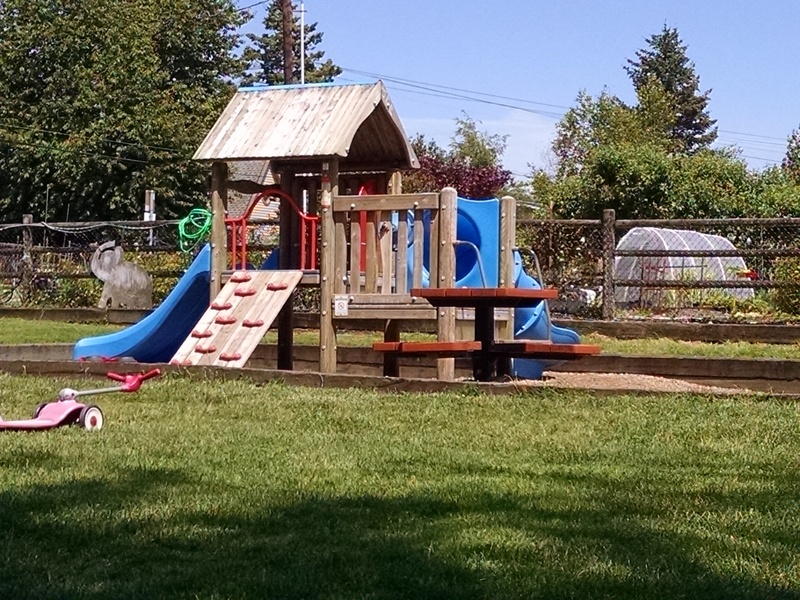 (Another fully fenced park is Phyllis Needy, in southern Kirkland.) It’s also flat, so there’s not the walking challenge for new walkers that some of our hilly parks pose. 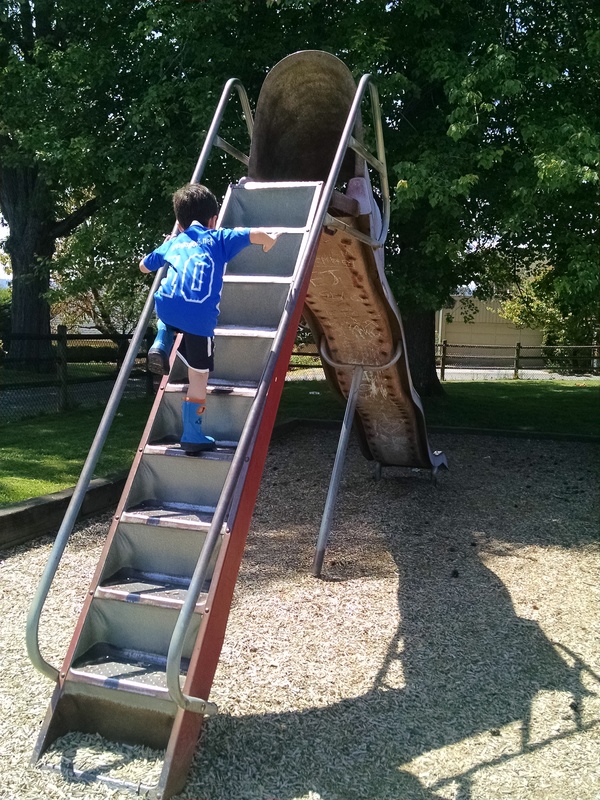 The main climbing structure is pictured above, and is good for the 2 – 6 year old crowd. There are three swings: a kids’ swing, a toddler bucket swing, and an ADA swing. There’s a car built of pipes you can climb in to and on to. When we were there in early June, there was a GREAT old slide, but it’s slated to be replaced sometime this summer, and I’m not sure when that’s happening. (It may have already happened). It’s an old style metal slide, with three bumps. They’re big enough bumps that our 42 pound kid “catches air” going over them. He’d say “ouch, ouch, ouch” on the way down as he went over each bump, but he continued to ride the slide over and over, so I think he liked it. There’s a fair amount of shade at the park. 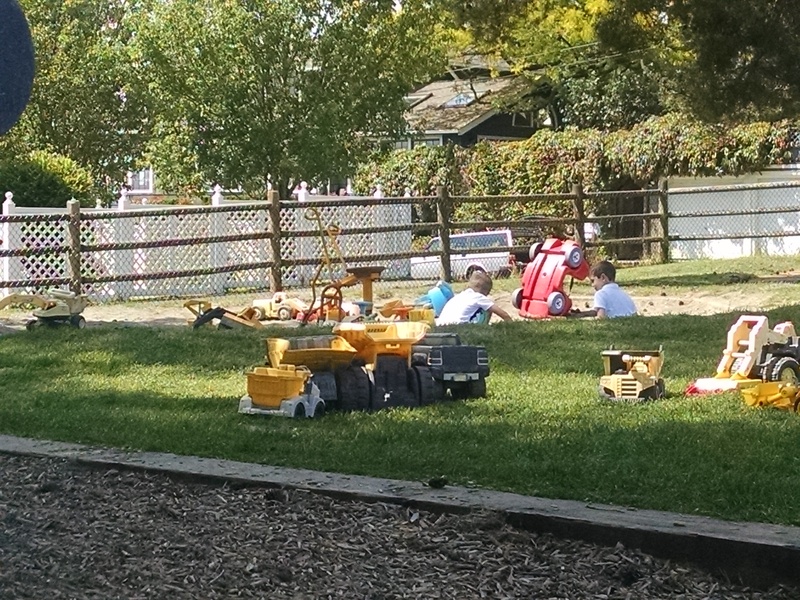 There’s a couple picnic tables in the shade for snack time or for parents to sit and socialize at. There’s a trash can just outside the gate – they ask that you pack your stuff out if possible, but if not, please use the trashcan, don’t leave your trash! There is a porta-potty there. There’s also a pea patch program at Tot Lot. More info at: Active Rain; My Parks and Recreation. 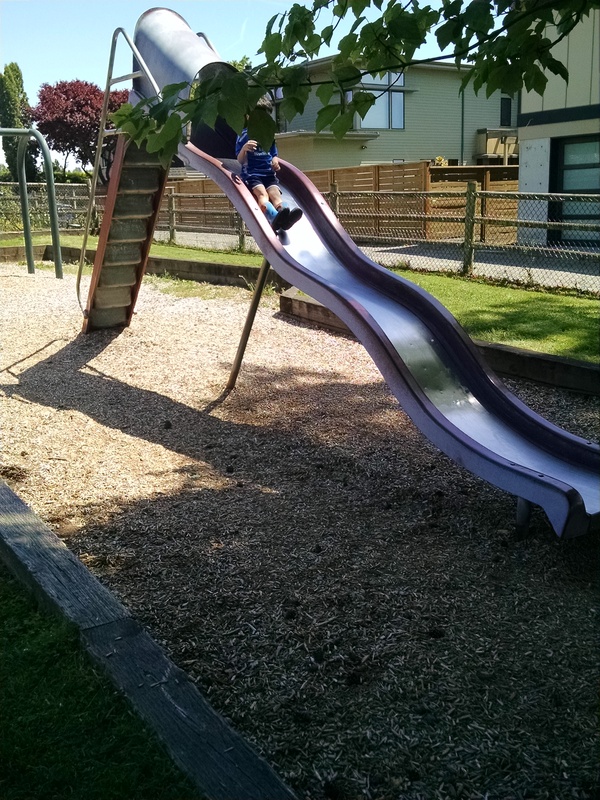 The park is at 111 9th Ave, just north of downtown Kirkland. This entry was posted in Eastside Parks, Seattle area and tagged Eastside, Kirkland, parks, toddler on June 29, 2016 by Janelle Durham. Yes, teach the behavior – teach when it is appropriate to apologize. Also teach that they can take actions that help to right their wrong. However, you can’t expect a young child to really feel sorry. As they get older, they will learn this empathy and learn to take responsibility for their actions. Don’t force a child to apologize. This is perceived by the child as punishment and shaming, and does nothing to teach them empathy for the other person or teach them what steps to take to make things better. Some children feel embarrassed or awkward, and stare at the ground, and shuffle their feet, and get more and more anxious until forced to blurt out the word. Others get into a power struggle with their parent, inflating a small transgression into a big battle, where the parent adds additional punishments – “no dessert till you say you’re sorry” till the child says a sarcastic ‘sorry’ through clenched teeth. Some kids will figure out that they should just get it over as quickly as possible, and mumble out the word “sorry” without looking at the person the apology is theoretically directed at, and then try to escape the situation as quickly as possible, moving away from the parent and from the person they apologized to. When apologies are used in this way, the child views apologies as a punishment for bad behavior. A forced apology is unpleasant and uncomfortable for everyone involved, and this awkwardness distances the apologizer from the person they are making the apology to. It does not encourage empathy toward that person’s experience, and instead can promote resentment toward them. 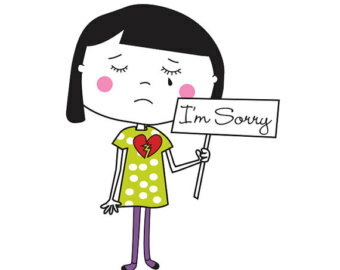 The person being apologized to often feels awkward as well, and moves away from the apologizer as quickly as they can. For older kids who understand what sorry means, forcing them to say it when they don’t mean it is teaching them to lie. The forced sorry can also feel like it “fixed” the situation. We hurt someone, but we said sorry so it’s resolved now, right? It implies that there’s no need to check in to see if it’s resolved, or to take any further actions to right our wrong. Should we teach a child to apologize? What does it mean to apologize? Of course we should teach apologies! We absolutely want to take steps in the toddler years and preschool years to teach empathy, to teach taking responsibility for our actions, and to teach the social skills that will aid them in later life. A true apology is an essential aspect of this. A true apology is not just good manners. It’s not just accepting blame for something. It’s taking responsibility for your actions, feeling empathy for the person you have wronged, and working to make amends. Here’s the thing – we can’t expect children to fully understand this when they’re toddlers or preschoolers! They are not yet capable of true empathy. We can role model empathy and working to right wrongs, and we can teach the behavior of apologizing – the understanding will eventually follow. As young as one year, a child may occasionally notice distress in others and try to soothe them. But other times, they are oblivious to the emotions of others. Around 18 – 24 months, a child starts to really understand that they are a separate individual from other people and that other people can have different thoughts and feelings than they do. But being able to put themselves in someone’s shoes and see how their actions made someone feel is just more than they can understand. So, we know it’s a while before they get the feeling side of an apology. But, we can teach the behavior long before that. Note, these are all low stress moments. Your child has unintentionally (or slightly intentionally) harmed someone, and we’re asking them to notice this, and make amends. This teaches more awareness of others, which leads toward empathy. Some preschool teachers choose to skip the ‘I’m sorry’, and go straight to the “Are you OK?” or “What can I do to help?” because those focus on empathy for the other person and moving toward a solution together. Other times, your child does intentional harm. We need to set limits on this and there need to be consequences. But the consequences for your child are about the behavior itself, and the apology is about caring for the other person. The consequences need to be separate from the apology. I recommend: disciplining your child as appropriate to the moment, and working on the apology later. The misbehaving toddler needs immediate consequences for bad behavior. The wronged toddler needs immediate reassurance. Apologies come later. Get down to their level and put yourself between them to prevent further harm. Once A is calmed down, then talk to him about biting [reminder of limits] and let him know that his actions hurt the other child [focusing the attention on making amends rather than on his wrong-doing]. In this scenario, the biting toddler received the immediate limit setting and consequence they needed. The child who was bit received prompt attention and reassurance. Later on, we handled the apology and moving on. Let’s be honest. Sometimes we force our child to apologize because we, as the parents, are embarrassed about our child’s behavior, and we don’t want the other family to think that we’re bad parents. How do we handle that? In the moment after the incident, we work with the children. They need immediate responses to understand. If we handle it well, the other parent (who has a longer attention span and memory than the children) sees that we did address the situation in a way that was supportive to everyone, set limits, and taught empathy skills. Later on, we can also talk it over with the parent, and apologize, and talk together about how we’re all just doing our best to help our kids learn. Sometimes an empathetic sorry is all that’s needed. But sometimes we need to take actions to make things right. (Like re-building a tower, fixing a broken toy, cleaning up a mess.) Help your child figure out what to do in these circumstances. In a study, 6 and 7 year olds were paired with a researcher and asked to build towers of plastic cups. Then the adult would “accidentally” knock over the child’s tower. The adult would either apologize OR say nothing, and then leave the room. Right after the incident, the children felt bad whether or not they received an apology. Later on, though, when children were asked to give stickers to their adult partner, the ones who had received apologies were more generous – presumably indicating they had forgiven their partner. When my older kids were little (back in the 90’s! ), I did not teach them to say “sorry” until they were four or five years old. I’d seen too many forced apologies, and too many times where the kid saying the word sorry was clearly not feeling the emotion of sorry. They were just doing what they had to do to complete their punishment. 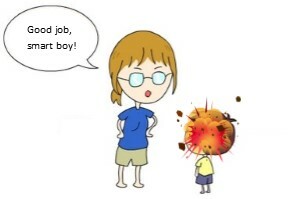 With child #3, when he was just learning to talk, I started teaching the behavior of “If you do something to someone and they say ‘Ow’, you need to say ‘I’m sorry. Are you OK? '” And every single time an opportunity came up, I reminded him of this behavior. He didn’t yet understand that he was responsible for hurting someone and he didn’t yet have empathy for the fact that they were in pain, because he just wasn’t old enough for his brain to be able to understand it. But, he could, and did, learn the behavior. Over time, I saw him start to get it. He would say sorry out of habit, and then when he asked “are you OK?” he would notice that they weren’t OK, and feel empathy for them. He started to understand that their sadness was due to what he had done and he started to take responsibility for it. I feel like he ended up understanding the meaning of sorry (both taking responsibility and feeling empathy for the other) much younger than my other kids, because the behavior caused him to pay attention to those situations. He’s now five, and often offers spontaneous apologies for any minor wrong he does to people. Sometimes when he’s really angry, the apology doesn’t come right away. That’s when I have to return to the method I describe above of: setting limits on him, reassuring the other child, and then when he’s calmed down helping him understand what he has done and working with him to make the apology. He’s still learning, because he is only 5 years old. Some days it comes easier than others, but I feel like we’re on the right path. Is it OK to get angry? Helping your child understand, accept, and manage anger. Teaching Emotional Literacy – it’s just as important as learning to read! 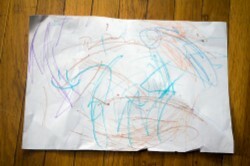 This entry was posted in Discipline, Parenting Skills and tagged apology, manners, preschool, social intelligence, sorry, toddler on March 2, 2016 by Janelle Durham.